‘La Mancha’ is a documentary film about filmmaking that seems to play as almost a mirror to the documentary ‘Overnight’ (read about that film in Sam’s article, Three Cool Movies about Movies). Where Troy Duffy successfully puts together the film ‘Boondock Saints’ almost despite himself and his ego, Gilliam’s project of passion, ‘The Man Who Killed Don Quixote,’ seems doomed from the start despite Terry’s earnest attempts to pull the picture together. Directed by Keith Fulton and Louis Pepe, the duo who made ‘The Hamster Factor and Other Tales of 12 Monkeys,’ a film that documented Gilliam during the making of ’12 Monkeys,’ ‘Lost in La Mancha’ picks up with Gilliam as production begins on his labor of love. Already restricted with a tight budget (he has half of what he needs to actually put his film together) and a precarious schedule, the hits come straight at him as soon as the bell rings. The last soundstage available, Gilliam finds out, is actually just a converted warehouse with an echo worthy of a cavern in Red Rocks and his principle actors, Jean Rochefort, Johnny Depp and Vanessa Paradis, cannot arrive to the set almost until the first day of shooting due to prior scheduling. When production finally begins, Gilliam and the crew learn on the first day that the area they have scouted and have been approved to shoot in is a NATO sanctioned military zone used for aerial target practice. Each of his shots is plagued by the sounds of jet fighters screaming overhead; a frustrated Gilliam anxiously tells the crew to keep rolling, they’ll fix the sound in post-production. The second day of shooting turns out worse: a rain and hail storm of almost biblical proportions hits the sets, causing waterfalls and rivers to actually carry away a lot of the equipment. When all is said and done, Gilliam learns that the storm has actually changed the landscape of his set, basically negating the prior day’s shooting because the look of the land is so drastically different now. The final blow to production comes in the form an injured Rochefort, playing Don Quixote, who suffers from a herniated disc and ultimately has to leave the production to seek medical help. Blow after blow, we watch as Gilliam is knocked back into his corner from the onset until, finally, production of the film is cancelled after 6 days of shooting. 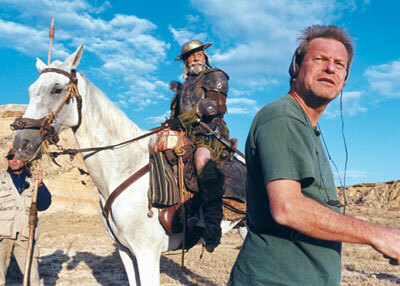 Yet, despite problem after problem, despite frustrated investors, despite the growing presence of various insurance representatives, Terry Gilliam’s hope and desire to make his Don Quixote film perseveres as he continuously strives to get film in the can. ‘Lost in La Mancha’ draws the parallel between Don Quixote and Gilliam as the director who, despite reality, holds onto his fantasy project with the innocent, earnest desire to make his movie. It’s that almost naiveté that makes readers love and care for Don Quixote and this film shows us that those are the same reasons we love Gilliam. His dreams of making the fantasy films he wants to make despite the mundane realness of the filmmaking business reminds us to chase our dreams. Every windmill we battle could end up being a conquered giant.